Or view larger version. Thanksgiving dinner at the Ringside Bar on Franklin Street in Oakland, California. Everyone was fed for free that night. ca. 1939–1945. Photographer unknown. Gelatin silver print. Collection of Oakland Museum of California. Gift of Mr. Edward Butler. Through the smoky haze filling the interior of the crowded Ringside Bar in Downtown Oakland, we can see the faces of both black and white patrons of this integrated establishment. 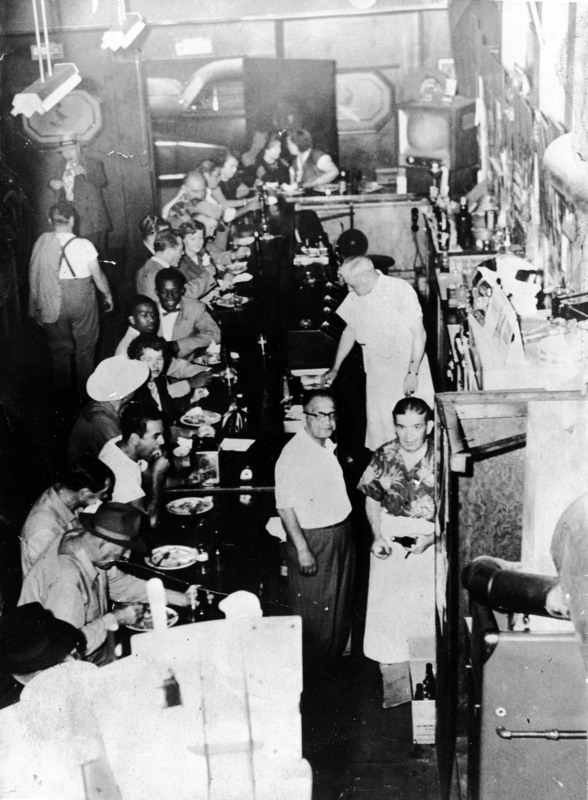 Even at the tail end of the Depression in 1939, it seems remarkable that the black and white patrons of the Ringside Bar are sitting down freely to eat Thanksgiving dinner with one another. However, during the Great Depression, Oakland's population was predominantly white. In Oakland and other Bay Area cities blacks, whites, Latinos, Asians, and American Indians all worked in unskilled labor occupations. In both male-dominated and female-dominated occupations, workers of all races often worked together on the job.